If you are contacting us regarding your child, please include your location, child's age, and a brief description of him/her in your message. 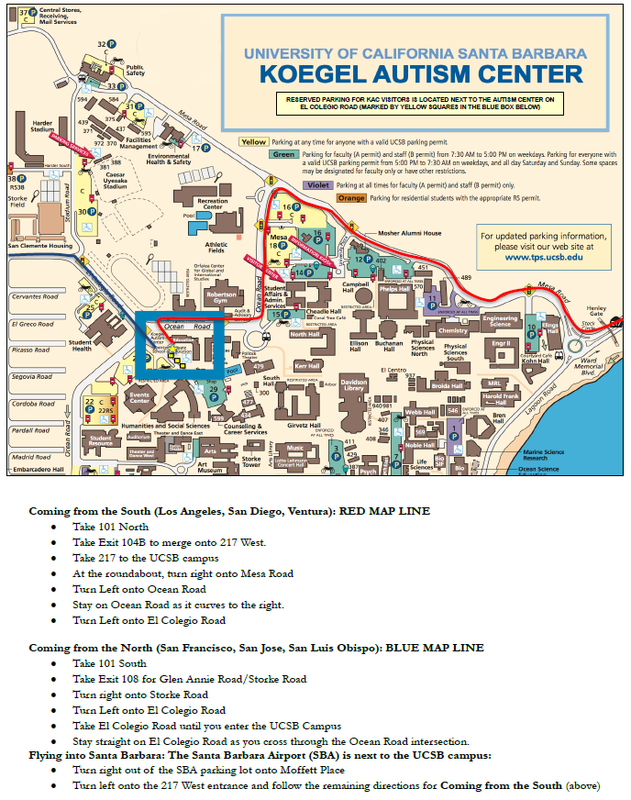 Traveling North on Highway 101: Take the Airport/UCSB exit (Highway 217) off U.S. 101, approximately eight miles north of Santa Barbara, to the campus East Gate. Turn right onto Mesa Road. Follow Mesa Road and turn left onto Ocean Road. Turn right at the stop sign to continue on Ocean Road. At the second traffic light turn left onto El Colegio Road. Turn left into parking spots labled "Registered KAC Visitor"
Traveling South on Highway 101: Take the Glenn Annie/Storke Road exit off U.S. 101, approximately 12 miles north of Santa Barbara. Turn right on Storke Road. Cross Hollister Avenue and at the third traffic light turn left on El Colegio Road. Enter campus on El Colegio. Cross Ocean Road and turn left into parking spots labled "Registered KAC Visitor"
If the Registered KAC Visitor Parking is full, parking permits can be purchased for the adjacent lot. Parking permits may be purchased by cash or credit cards, continue on Ocean Road and turn left into Parking Lot 22. If you have additional questions concerning parking at UCSB, you may stop by a parking kiosk at the entrance to the Mesa Parking Structure, call UCSB Parking Services at 893-7275, or visit their website at www.tps.ucsb.edu.